Human factor, effectiveness, gender, enhancement, skills, communication, collaboration, cocreation, family, nonary thinking, education, skills gap. The Matrix-Q Research Institute intents to contribute with its body of knowledge applied for women empowerment, protection of their rights, care for their well being, as children, adults or senior. In this context the Matrix-Q Research Institute will intent to proof that family keep being a vessel for humanity to evolve and that it actually holds within itself all the nurturing substances, experiences and challenges that can help humanity and culture evolve. Including both male and female human species, men and women. Provide support to organizations for the assessment of SDG5, and capacity of integration of an inclusive approach to gender through Matrix-Q Skills and Co-creativity nonary thinking model. After assessment solutions will be designed and implemented, including training and coaching. Focus on acquisition of emotional intelligence skills and gender skills. As result leadership, communication, collaboration, cocreativity and family-life-work balance will be enhanced. Supports individuals, leaders, families, organizations in the process of application of Matrix-Q knowledge, tools and skills for global sustainable development, from SDG5 approach. Gathering of stakeholders, leaders and community, discussion on Matrix-Q Knowledge studies and themes on gender, family, business and sustainable development. Nature cycles, rhythms, principles and laws have a purpose and generate an empowering force that leads nature towards the sustainability of life. Humans are not deprived from that possibility. On the contrary, through a conscious choice may return to nature, by collaborating and understanding the function and empowerment that means their own natural cycles, shifts of hormones,along the 4 seasons, and develop the ability to embrace them and utilize them as an empowering force. Gender equality starts at the individual, when both men and women acknowledge having the capacity and possibility to explore and develop unique skills, male and female skills. Which as a result creates a stronger foundation for communication, collaboration, effectiveness. Co-creativity means to understand the value of parenting and co-parenting as an opportunity to advance skills towards a more effective communication, and collaboration. Being family and parenting the best school for co-creativity, decision making. Perception and acknowledgement of value, of both men and women, of their roles and skills, for co-creation. Parenting experience triggers naturally a profound force and advances the individual skills and intelligence towards family care and well being. This profound experience gives to the individual access to a possibility of resources and skills that is nurtured and supported by nature itself. An empowering force able to help individual advance their skills, knowledge and understanding of male and female principles of cocreativity. A systemic and holistic assessment of organizations, by utilizing Matrix-Q Assessment Tools. 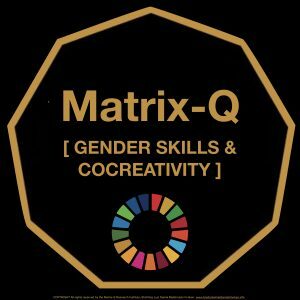 Organizations and communities by acquiring Matrix-Q Knowledge Tools and Skills [Matrix-Q – Gender Skills & Cocreativity applied to Global Sustainble Development] will be able to create a systemic change at 9+ levels of their development, from individual level to family, community, organization, and generate impact globally as well. Our goal is to provide to SDG Entrepreneurs, SDG5 Professionals and Leaders the Matrix-Q Knowledge, Tools and Skills necessary for them to advance their effectiveness at work. Through publication of articles and research studies presentations on an international scientific research platform, we have reached professionals world wide. As well through social media, we communicate with sustainable development professionals. We are reaching international and national organizations and leaders along 2018.